Yet the "bigger is better" faith in local government amalgamation remains compelling to many from both the Right and Left. 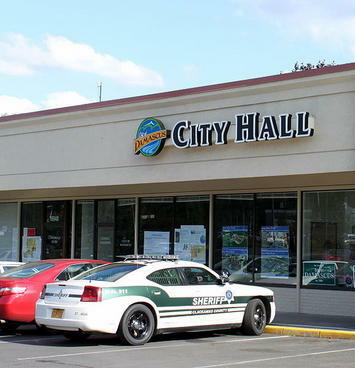 Proponents claim that smaller local governments are obsolete, characterizing them as being from the horse-and-buggy era. The same logic could be used to eliminate county and even state governments. However, democracy remains a timeless value. If people lose control of their governments to special interests (which rarely, if ever, lobby for less spending), then democracy is lost, though the word will still be invoked. Support of local government amalgamation arises from a misunderstanding of economics, politics and incentives (or perhaps worse, contempt for citizen control). When two jurisdictions merge, everything is leveled up, from labor costs to service levels. The labor contracts, for example, will reflect the wage, benefit and time off characteristics of the more expensive community, as the Toronto "megacity" learned to its detriment. Further, special interests have more power in larger jurisdictions, not least because they are needed to finance the election campaigns of elected officials, who always want to win the next election. They are also far more able to attend meetings – sending paid representatives – than local groups. This is particularly true the larger the metropolitan area covered, since meeting are usually held in the core of urban area not in areas further on the periphery. This greater influence to organized and well-funded special interests – such as big real estate developers, environmental groups, public employee unions – and drains the influence of the local grassroots. The result is that voters have less influence and that they can lose financial control of larger local governments. The only economies of scale in larger local government benefit lobbyists and special interests, not taxpayers or residents. Usually stymied by the electorate in their attempts to amalgamate local governments, regional proponents often make municipal tax sharing a priority. The idea is that suburban jurisdictions should send some of their tax money to the core jurisdictions to make up for the claimed financial shortages of older cities. Yet this ignores the fact, as Figure 1 indicates, that larger jurisdictions generally spend more per capita already and generally tax more, as our state reports cited above indicate. 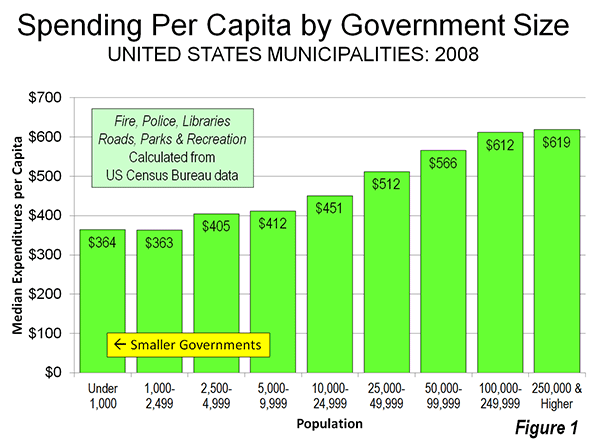 Larger jurisdictions also tend to receive more in state and federal aid per capita. A principal reason is that the labor costs tend to be materially higher in larger jurisdictions. In addition to paying well above market employee compensation, many larger jurisdictions have burdened themselves with pension liabilities and post employment health benefits that are well above what their constituencies can afford. The regionalist solution is not to bring core government costs in line with suburban levels but force the periphery to help subsidize their out of control costs. Howard Husock, of Harvard University's JFK School of Government (now at the Manhattan Institute) and I were asked to evaluate a tax sharing a plan put forward by former Albuquerque mayor David Rusk for Kalamazoo County, Michigan (The Kalamazoo Compact) more than a decade ago. Our report (Keeping Kalamazoo Competitive)found no justification for the suburban areas and townships of Kalamazoo County to share their tax bases with the core city of Kalamazoo. The city already spent substantially more per capita, received more state aid per capita and had failed to take advantage of opportunities to improve its efficiency (that is, lower the costs of service without reducing services). We concluded that the "struggling" core city had a spending problem, not a revenue problem. To the credit of the electorate of Kalamazoo County, the tax sharing proposal is gathering dust, having been made impractical by suburban resistance. The wanton spending that has gotten many larger core jurisdictions into trouble should not have occurred. The core cities are often struggling because their political leadership has "given away the store," behavior that does not warrant rewarding. Elected officials in the larger jurisdictions had no business, for example, allowing labor costs to become higher than necessary or granting rich pension benefits paid for by private sector employees (taxpayers), most of whom enjoy only much more modest pension programs, if at all (See note below). At the same time, the smaller, suburban jurisdictions around the nation are often the bright spot in an environment of excessive federal, state and larger municipal government spending. Their governments, close to the people, are the only defense against the kind of beggar-the-kids-future spending that has already captured the federal government, state governments and some larger local jurisdictions. Even if President Obama is not re-elected or if a second Obama Administration does not pursue the anti-suburban agenda, the threat to the suburbs will remain very real. This is not just about the suburbs, and it is certainly not some secret conspiracy. What opposing regionalism means is the preservation of what is often the last vestige of fiscal responsibility. It is not that the elected officials in smaller jurisdictions are better or that the electorate is better. The superior performance stems from the reality that smaller governments are closer to the people, and decision-making tends more to reflect their interests more faithfully than in a larger jurisdictions. Ed. note: This piece was corrected to add quotation marks around the word "destroy" in the first paragraph. That clause is included in reference to Kurtz's characterization, not the author's. Note: A report by the Pew Charitable Trusts (Promises with a Price) indicated that "... in general, the private sector never offered the level of benefits that have been traditionally available in the public sector." The report further indicated that 90 percent of state and local government retirees are covered by the more expensive defined benefit pension programs, compared to 20 percent in the private sector. The median annual pension in the state and local government sector was cited at 130 percent higher than in the private sector. While 82 percent of state and local government retirees are covered by post-employment medical benefits, the figure is 33 percent in the private sector. According to the Bureau of Labor Statistics, after accounting for the one-third higher wages per hour worked among state and local government workers, employer contribution to retirement and savings is 160 percent higher than in the private sector (March 2012). A just published Pew Center on the States report (The Widening Gap Update) indicates that states are $1.3 trillion short of the funding required to pay the pension and post employment medical benefits of employees. This does not include programs administered by local governments. Lead Photo: Damascus City Hall (Portland, Oregon metropolitan area) by Wiki Commons user Tedder. Submitted by juliaware on Fri, 09/13/2013 - 05:44. Submitted by juliaware on Sat, 08/17/2013 - 01:24. Submitted by juliaware on Thu, 08/22/2013 - 06:45. Submitted by juliaware on Mon, 08/05/2013 - 02:27. Submitted by new building by som on Thu, 08/01/2013 - 21:16. Thank you so much for the post you did. I do wish there were more people like you around on the interwebs. Just stumbled across your blog and was instantly amazed with all the useful information that is on it. Submitted by nayelialexa on Thu, 07/04/2013 - 07:02. Submitted by Fenny on Wed, 07/03/2013 - 02:43. I was really moved by reading all these facts. Hope everything goes fine, and our politicians starts realizing the truth. Submitted by Fenny on Tue, 07/02/2013 - 08:03. Well, I am not very good at discussing economical and financial matters, but I can definitely help you to learn a new laguage much easily. Submitted by lushacres on Wed, 06/19/2013 - 22:18. Lush Acres EC is also near elite schools such as Pei Hwa Secondary School, Nan Chiau Primary School, Nan Chiau High School.